How do I setup PayPal Website Payments Pro with my Create site? PayPal Website Payments Pro is a good way to take payments through your Create shop. To get set up with your PayPal Website Payments Pro account you will firstly need to apply for an account with PayPal and fill out a simple business credit application. This can typically take up to 7 days to be approved, however once this has come through you will be ready to use all the amazing features of PayPal Website Payments Pro! Set up recurring payments and subscriptions for your customers. 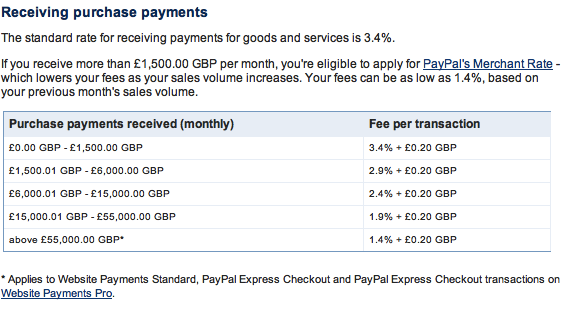 The cost for PayPal Website Payments Pro is £20 per month as well as a small transaction fee. The fee depends on the amount of money you are taking through the gateway, below is a table outlining the fee for receiving payments. Click "Shop Settings" on the left-hand menu and then click on "Payment Gateways"
Click "Add New Gateway" then click the "PayPal Logo. Then make sure you check "PayPal Pro” from the "Type of PayPal integration:" setting. Then you will be able to add your PayPal Primary Email address and PayPal Secure Merchant ID. Click "Add Gateway" to confirm. The payment gateway will now be added to your account.